There are few trees that are more dramatic when in flower than the spring explosion of the Eastern Redbud (Cercis canadensis). Part of the unusual show is the eruption of flowers before any leaves emerge along the graceful stems of the tree in that spectacular fuchsia pink color. How could you not like how this looks after the long winters of the northern climates of North America? 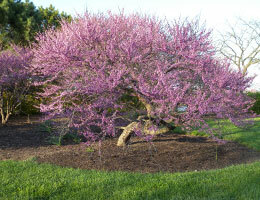 The Redbud is a difficult tree to get established and is best installed or transplanted only when it is in flower. Like any new transplant in the Chicago area mulching the existing and potential root zone of the tree, as shown here in it’s site at the Chicago Botanic Garden in Glencoe, will greatly enhance it’s chance for survival and thriving. The summer heart shaped leaves of this exquisite ornamental tree are a deep green with a slight dark violet hue. If any tree deserves the title of romantic, this one has my vote. This tree is a relative of the Honey locust and both the flowers and indeed the buds are edible and good for putting in salads. It is sometimes called the Judas tree because of the Christian oral history surrounding it. Before Jesus was hanged by crucifixion, he was betrayed by His friend, Judas Iscariot, who, it is believed in anguished remorse of his action went out and hanged himself on a Redbud tree. The history also holds legend that the tree blushed in shame and was forever after pink. The Trillium, Bellwort, Cranesbill, Wood Anemone and other spring woodland wildflowers are in a desperate race to live their life cycle before the leaves foliate the trees. It takes a lot of sun energy to produce flowers, fruit, bulbs, and buds which is what it takes for these flowers to continue to survive. When the tree leaves mature they block 98% of the suns energy from the forest floor. So as soon as mid March the wildflowers are making use of the light and by the end of April they are finished and going dormant for the rest of the year. THE COMPETITION FOR ENERGY IS FIERCE, forcing woodland flowers to live their whole above ground year in just four to six weeks. Even though there is competition, the trees and flowers have worked out a way to live in perfect synergy. The fallen tree leaves warm the soil and protect the flower bulbs through the winter. In the late winter the soil microorganisms break the leaves down into essential plant nutrients. But it is too early for the trees to use the nutrients and the spring rains would wash them out of the soil if it weren’t for the wildflowers. They are in their most active growth period and they gobble the nutrients up, thereby holding them in the system. Then, just when the trees need the nutrients to support their great stately growth, the lowly woodland wildflowers go dormant and give the nutrients back. What lessons do the trees and flowers have for us? For our landscapes one lesson is to grow trees in native associations. That’s not really as hard as it sounds. It just means that you isolate your trees and shrubs from grass and thick ground covers as they do at the Morton Arboretum and Chicago Botanic Gardens. Create woodland gardens. Next, don’t rake leaves out of those non-grass areas....EVER. Don’t use fossil fuels and other precious resources (your money) to rob the trees of their natural nutrients during spring and fall cleanup. If you really want to mimic the simple forest economy, have your landscaper grind the grass clippings and leaves into mulch and leave it on your grass or in your woodland gardens. Third you can plant just a few wildflowers every fall, and if you don’t use pre-emergence herbicides your wildflower garden will spread every year. If you’d like to get a few ideas take a walk through the woodland wildflower gardens at the Chicago Botanic Gardens. Did you know that over 99% of the bees in a hive are female and the girls do all the work! The hive is an amazingly complex system of cooperation and mutual care. 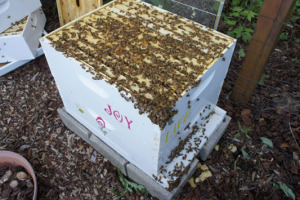 Much to my surprise, I find myself going out to the hives and greeting the girls almost every day just to watch them busily go in and out of their home. I am always relaxed by watching them for a moment or two and usually learn something interesting in the bargain. After our unexpected bounty of honey in the fall I created beautiful labels and gave honey away as gifts to many friends and family. So many people stated that it was the best honey they ever tasted that we were actually surprised. Then just recently I read an article which might explain why and greatly saddened me about the fact that the majority of honey sold in stores isn’t really honey at all.